This recording is my attempt to document my relationship with Grendel in a single, multi-movement free-improvisation focusing on personal, idiosyncratic performance techniques and practices - all of which came about in my effort to get as much out of Grendel as possible. Grendel is the follow-up to the CD Eric Wallack released under the Vermis moniker (see AI #21) and consists of a continuous steel string Silvertone acoustic guitar solo performance with no overdubbing. Eric notes that he intentionally recorded Grendel "in mono on an ailing reel-to-reel tape deck because it suits the primal nature of this piece at the expense of audio quality". Personally I can detect no loss of audio quality. It sounds great and I can easily discern all the subtle tones and harmonics produced by the Silvertone, even in it's quietest moments. Like Vermis, Grendel showcases Eric's brand of guitar improvisation that draws on influences ranging from Fahey/Kottke, jazz, Blues, and a variety of avant-garde free-improv stylings. But I found Grendel to be a far more passionate work, owing much perhaps to the focus on his subject. One thing that jumped out at me while listening to Grendel, and this hit me far more than Vermis did, is what a skilled musician Eric is. He does an excellent job of cranking out creative and interesting free-improv techniques while at all times demonstrating what an expressive artist and proficient musician he is. At times I imagined an avant-garde version of Michael Hedges. But there are as many quiet moments as there is fast paced intensity, and Eric communicates with as much beauty and passion in either realm, which really gives the feel of the multi-movement piece that he set out to do. In summary, this is one of my favorites of the many free-improv recordings I heard in 2002. Eric excels at creating avant-garde music that also manages to be highly accessible, providing just enough bits of traditional styles to appeal to the curious music fan who is unaccustomed to free-improvisation, but also offers much to delight the veteran listener. Recommended. Be sure and read the review this issue of Eric's duet recording with Bret Hart. 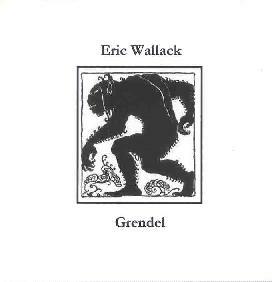 Grendel is available for purchase from http://www.homemademusic.com/artists/ericwallack. The last time I checked that site they still only had Vermis listed so note that you can also email Eric directly at: ewallack@owens.edu.